Dry shake, wet shake, strain. 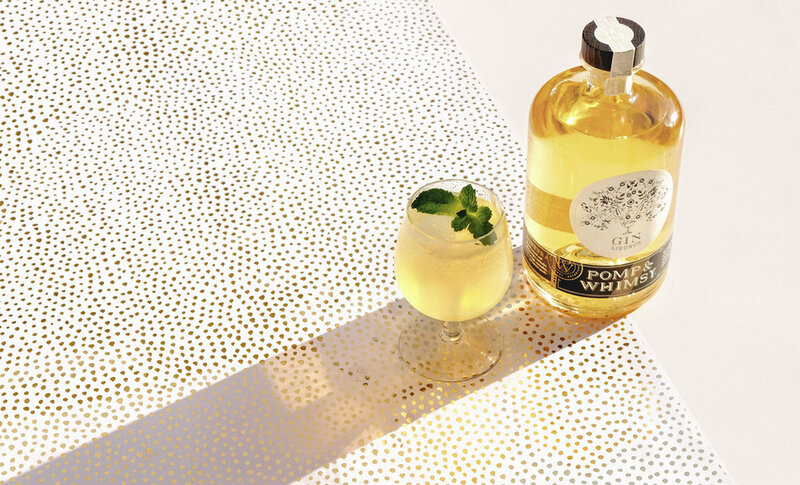 Pour P&W over ice in a cocktail shaker and swirl until well chilled. Strain into a coupe and top with champagne. Garnish with a fanciful twist of citrus. Build the first three ingredients in a glass over ice. Top with 2 oz Q tonic, and garnish with a grapefruit peel rosette. Build over ice in a double old-fashioned glass. Garnish with an oversized twist of grapefruit. Try different bitters to highlight the diverse botanical notes. Combine all ingredients, add ice, and garnish with a lemon wheel. Combine in a cocktail shaker filled with ice and shake until chilled. Strain into a Nick and Nora glass. Garnish with expressed lemon peel and a sprig of thyme that has been gently rubbed between the fingers to release its oils. Short shake the P&W and grapefruit juice; pour over ice in a highball glass. Top with the tonic and a squeeze of lime. Give it a quick whirl and serve. Twist a piece of lemon peel over the drink for aromatics and use the twist as a garnish. Muddle the peach slices and fresh raspberries in a tall glass. Add P&W and rosé. Steep awhile, if there's time. Add ice, top with additional fruit and club soda, stir. Build the first four ingredients in a glass over ice. Top with club soda to taste, stir, and garnish with fresh blackberries and sliced pear. *To make the fruit syrup, heat equal parts sugar and water, pear slices, blackberries, vanilla bean, and 1-2 star anise on stovetop. Simmer for five minutes, strain, and cool. Build over ice in a double old-fashioned glass. Garnish with a lime wheel. Shake ingredients with ice. Strain over ice into a glass and garnish with much muchness. Shake ingredients with ice. Strain into a chilled coupe or martini glass, and garnish with a lemon wheel and jasmine flower (dried or fresh). Add all ingredients to shaker and shake for 10 seconds. Strain into glass and add club soda. Garnish with a handful of mint. Steep 1 tsp of Earl Grey tea with the cinnamon stick in a small tea pot with 4oz hot water for 3-4 mins. Pour 2 oz P&W into two porcelain tea cups, and strain 2 oz of the hot tea into each cup. Garnish with a lemon wheel. Serve immediately, pinkies out. For an Oriental twist: replace the Earl Grey with jasmine pearls, and omit the cinnamon and lemon. Garnish with 1 slice of orange if desired. Also, delightfully refreshing served chilled. Add all ingredients to a cocktail shaker, and shake vigorously with ice for 20 seconds before straining into a coupe. For a modern twist on a classic margarita, replace watermelon with all lime juice. Pour the first three ingredients over ice and top with soda water. A celebratíf to share with a circle of your closest friends! Pre-chill or shake the ingredients with ice. Strain into a cordial glass. Shake the ingredients with ice. Strain over ice into a lowball or old fashioned glass. Combine in a mixing glass or cocktail shaker with ice. Stir well to chill. Garnish with a lemon peel and sprig of rosemary. Just as noteworthy with bourbon. Pour P&W over sorbet for a delightful palate freshener between courses, or in place of dessert.